I know I haven't been posting at my usual frenetic pace. Work has kept me very busy and the blogging has fallen by the wayside a bit. I have still been shooting trains every now and then, and here are a few of the VIA trains I've seen in May that I haven't already blogged about. Back on May 5 I was out at noon to shoot the Thursday Canadian. This one had a Rocky Mountaineer car on it, coach RMR 3251. This was the first "summer" Canadian so it was much longer than the usual 9 or 10 cars of the winter version. As I recall, they stopped for a signal short of St. James Junction, so they were going pretty slowly when they passed me. The next VIA I saw that I haven't blogged about yet was May 26's Canadian. This was another Thursday VIA 1. This was an entirely ordinary Canadian with no deadhead cars, shot at Waverley Street in Winnipeg. What made this one special was the meet with CN 114. I was worried that 114 was going to block my shot of the Canadian, but the RTC gods were smiling and 114 was on the north track. VIA 1 shows up at 2:30 minutes in the video. Finally, I shot both VIA trains this past Saturday, VIA 1 and VIA 692. First, the Canadian at mile 10 of CN's River subdivision. This had old friend VIA 1721 deadheading behind the engines and ahead of the baggage car. The other old friend was VIA 6414, the Loto Quebec engine. The weather turned pretty sour during the day Saturday, and there was some lightning and rain (and a tornado watch!) when VIA 692 returned to Winnipeg from its long trip from Churchill. I shot the Hudson Bay at Diamond. Check out the video, and the lightning at 0:16. You may recall that I visited the Dundonald grain elevator near Portage la Prairie back in March. I shot the elevator and its engine but the shots didn't turn out, due to a bad camera setting. I was in Portage yesterday for a model train show and decided I had to get the shot again. You can be sure I checked the photos afterward! The engine is parked right beside the elevator, under shelter. The engine is a GP15-1. According to this page it was built for Conrail in December 1979 as CR 1661. It became part of Norfolk Southern after Conrail was broken up and was sold to GATX Leasing. Eric Gagnon, author of the excellent Trackside Treasure blog, has published a book, Trackside With VIA: The First 35 Years. 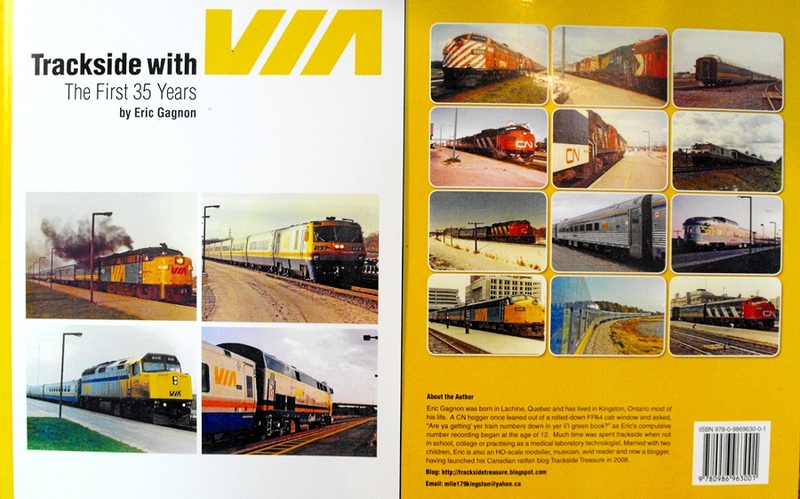 The book details many of the interesting VIA Rail consists he has seen over the years, with photos and commentary. The book is self-published and available via this order form. The cost is $25 and shipping is free within Canada. There's a good article in the Financial Post about today's very long trains. Observers of the railways in North America will have noticed the gradual lengthening of trains from the 1990s trains not exceeding a mile in length, to today's trains, which can exceed two miles in length. The main drivers behind the increase in length are twofold: using more track capacity, and reducing the number of crews required. Packing more cars per train means you can run more tonnage over a given line. Perhaps more importantly, running fewer trains means you need fewer crews to man them. The railways have invested heavily in increasing train lengths. Siding lengths have had to be increased, often more than once in the past two decades, to allow longer trains to meet and pass each other. Many locomotives are now equipped to be controlled remotely, as Distributed Power Units (DPU). Placing DPU engines in the middle or rear of trains reduces the in-train forces caused by acceleration and deceleration to be reduced, bringing down the risk of derailments. CN in particular had a number of accidents in British Columbia after they took over BC Rail due to the lack of DPU engines in the long trains they ran through the mountains. As the article says, how long can trains go? A hat tip to Matt aka Saintjohnrailfan for the article link! Thursday's VIA Canadian had an old friend on it. Not a pretty friend, but an old friend. I shot VIA 1 at about mile 9.5 on the CN Rivers subdivision as it was leaving Winnipeg. The lead unit was VIA 6443, a refurbished unit, but the old ugly stepsister was the second unit, the Loto Québec VIA 6414. Maybe I'm too harsh, but most railfans think the Loto Québec wrap is the ugliest wrap VIA has ever had. I first saw VIA 6414 in the Loto Québec scheme in Amherst on the eastbound Ocean on November 3, 2006. I saw it the next day in Halifax as the second unit on the outbound Ocean. That was it for a couple of years, until May 26, 2008 at Nepisiguit Junction outside Bathurst, NB where it was leading the westbound Ocean. Anyway, enough about that brown unit. One unusual car in the consist was VIA 1721, one of the three ex-BC Rail cars that VIA purchased. As usual you can view the complete consist in my sightings database. The NB Southern Railway will be leasing four GP38-3 engines from Helm Financial. Since NBSR will be operating the Northern Maine lines, it will need more power. The units are HLCX 906, 909, 913 and 917. They are all ex Union Pacific units. Apparently one of those was a GP40 but was rebuilt into a GP38-3. NB Southern has leased locomotives before, but it has been a number of years. The rumour mill says they will arrive in New Brunswick before mid June. They are currently in UP yellow but will be repainted to NBSR green after they arrive. I look forward to seeing pictures from out East soon! Operation Lifesaver has a series of videos with the theme "The Next 60 Seconds". Powerful stuff. When I was waiting for the Coors Light Silver Bullet Express on the morning of April 11, I took some shots of the Dugald elevator while the sun crept toward the horizon. There's a reason why photographers call sunrise and sunset as the "golden hours". Ken Secrest has put a number of CN train order scans online. They are for the northeastern US but feature a variety of CN, Central Vermont and I think Grand Trunk engines. On Friday afternoon I drove from Halifax to Moncton. I tried to time it so I could catch VIA 14 (the Ocean) somewhere between Truro and Halifax. I looked at Enfield but didn't find any angles I really liked, so I made my way to Elmsdale amongst some very bad drivers. I parked on the Elmsdale Road near where it crossed the tracks, and tried to find a good location. There is a bridge there over the stream, but there is no good place to shoot eastbound trains from. I ended up walking to the former station, and as I was getting my camera out, I heard the train. Quickly I took a shot as they blasted by. The engineer gave me an extra toot as they passed. After that, it was back on the highway and off to Moncton. As I neared Moncton I heard CN 539 call the RTC to say they were heading out to Amherst. The RTC said they would have to stop at "Kinsac" and get further orders. I was confused because Kinsac is near Dartmouth! I eventually figured out that he said "Painsec" with a French accent. I took the Shediac Road (route 134) exit and headed north to the tracks. There CN 9584 was waiting at Painsec West, just west of the crossing, for their light. It looked like they might be a while, so I went to the actual Painsec Junction where the Point du Chene spur branches off to the north. I had never been there before. There's not a lot to see - the two tracks of the main and siding, and the Point du Chene line branching off into the wilderness. In due time the CN foreman gave up his block and CN 539 got their orders to proceed. They rolled by with their two engines and two freight cars. I proceeded to Gordon Yard to take inventory of the units there. Two GP40s were shunting in the yard (CN 9468 and CN 9433), which was nice to see because I don't see GP40s very often in Winnipeg. That was the end of the evening for me, and probably the end of my railfanning in the Maritimes for this trip. Thanks for reading! I didn't go out Tuesday night, so Wednesday was my next railfan evening. First I went to Rockingham to find CN 121. They were already at Millview, waiting for the conductor to be brought to the head end of the train. For a wonder, it wasn't raining! Behind the engine is Bedford Basin, with the A. Murray MacKay bridge visible. Haligonians call this the "new" bridge, as it is the newer of Halifax's two bridges spanning the basin. It was opened in 1970, whereas the older Angus L. Macdonald bridge was opened in 1955. But I digress. I drove out to Windsor Junction to shoot 121 there. I set my Canon T1i up on the tripod and waited. It didn't take too long for the train to blast through the Junction. I heard they had a pickup at Milford but I had no interest in chasing them in the near dark. I turned around and headed to Dartmouth. I heard CN 513 getting ready to leave Wright's Cove, so I grabbed a sandwich at Subway and went to the switch at mile 10.1 where they rejoin the Dartmouth subdivision. Two crew were riding the rear of the train as it backed out onto the main, and I received a nice friendly wave from one of them. Once the entire train was on the main, the engineer stopped the train and dismounted. He threw the switch to line it for the main, then boarded the train, gave me a wave, and opened the throttle wide open. What a great display of smoke! The train had IC 2709 and CN 8015 for power, the same two engines I saw on Sunday. From this point, the procedure seems to be that the engineer stops the train short of Wright Avenue to wait for the conductor to be taxied there. The conductor then boards and they head out to Milford to get the loaded cars for the return trip. Thursday night was slide night, but before I met my good friend Bill Linley and his lovely wife for supper, I stopped by Fairview to see what engines were there. Four engines, SD70M-2 CN 8890, SD75I CN 5710, Dash-9 CN 2688 and SD75I CN 5605 were parked in the usual spot. Well, I saw a fair number of trains while I was in Halifax this past week. I mentioned that I caught a couple of Ocean trains. While I was passing through Moncton on May 8 I also saw some units at Gordon Yard - complete sightings here. I spent a little time watching CN 121 Sunday night in Halifax. First they pulled forward. Then they pushed back to couple onto DPU engine CN 2205. I shot them leaving Millview but I screwed up the focus, so I won't inflict that video on you! I mentioned that I saw some units in Moncton on May 8. One set I saw was IC 2709, CN 9541 and CN 8015. That turned out to be the power for the gypsum train (CN 513) in Dartmouth on Monday, May 9. They must have come down with CN 120 Monday morning. As you can see, it was a bit rainy this past week. The funny thing was that apparently the CN crew wasn't supposed to take CN 9541 as it needed new brake shoes. So they ended up shoving up into Burnside to drop 9541 off there before continuing on to Milford with the empty gypsum cars. I didn't stick around for that as I was meeting my friend Chris M and his girlfriend to go look at CN 509. I've known Chris for a while online but we had never met before. We stood around and chatted in the light drizzle before finally deciding that 509 was in the yard in Dartmouth. We went and looked, and sure enough CN 4787 and another GP38 were parked there. No worries! That was a busy Monday night. I saw all the trains there were to see in Halifax - CN 121, CN 513 and CN 509. Just a reminder that the HALIFAX slide show is tomorrow (Thursday, May 12). I will be attending this show and showing a few images of my own from Winnipeg and beyond. As Bill Linley said, "The action begins at 7.00 p.m. on the 12th at St. Margaret's of Scotland Church Hall on Robie Street north of Lady Hammond. See you there!" After the excitement of the steam engine in March, another steam engine was sighted on Canadian rails! This one headed east to Halifax, then onto a ship to return to its home country, England. That engine was the Dunrobin. The "Dunrobin" is an 0-4-4 tank engine, built in Glasgow by Sharp Stewart in 1895. It spent many years in British Columbia at the Fort Steele Heritage Town, but has been sold to the Beamish Museum. The Beamish has an article about the purchase. A two-axle coach, the 2nd Duke of Sutherland's coach, was also sold. The Dunrobin was loaded onto a truck on April 16 and taken to Calgary to be loaded on a flatcar. Jeff Keddy shot it as it passed through Winnipeg on April 22. The shape of the steam engine is obvious. The other object under tarp on the flatcar is a two axle coach, also purchased for the Beamish Museum. The Dunrobin was spotted on a CN freight in Ontario on the afternoon of April 28, and later in the evening at Dorval in Quebec. David Othen reported that the Dunrobin and coach arrived in Halifax on CN 120 at about 9:50 AM on May 1. Here is David's video. You can see the Dunrobin at 0:25 and also at about 4:30 in the video. The Dunrobin was loaded onto a ship around May 8 and set sail for England. I hope they enjoy it at its new home! It's been a while, but I have seen the Ocean again. Not the Atlantic Ocean, the VIA Rail Ocean. I am out on the east coast of Canada for the week and I'm taking the opportunity to shoot some trains I normally don't see in Winnipeg, namely VIA trains with Renaissance cars. I shot this VIA 15 at Berry Mills, NB just outside Moncton, shortly after I landed there on May 6. The trailing unit was VIA 6411, the former Operation Lifesaver unit. The engineer gave me a toot as they rushed by at track speed. I also shot VIA 15 at Memramcook, NB on the other side of Moncton on May 8. I wanted to shoot it at David Morris' favourite location, the "Bull Barn", just east of Memramcook. I thought I had lots of time to get the shot, but I dithered about where to park the car. I ended up jamming it into a disused driveway and jogging up the hill to get the shot. As I finished jogging up, the train was right there ready to be photographed. Fortunately I had the right lens on the camera and got the shots I wanted. Railfans have been tracking the Coors Light Silver Bullet Express engines (VIA 6445 and 6408) all over Ontario and Quebec. Now that the actual Express is done, VIA is using these engines in regular passenger service. As a result, many photos are becoming available. Before I get into details, I want to point you to two links. First, this page by Marc. He has assembled a lot of good information about the Coors Light train, some from my pages and much from other people. There are some great shots there of the actual Coors Light train by itself. The shot of the train with the horses (by Ken Storey) is spectacular. Check out Ken's trip report. Now, on to the details. These engines get around! 2011/04/27 - John Reay shot VIA 6408 on VIA 70 in Brantford, Ontario. 2011/04/29 - Walter Pfefferle shot VIA 6408 in Woodstock, Ontario. Here's a video of VIA 6408 arriving at Brantford, ON, shot by DieselDoc68. 2011/05/01 - Steve Taylor shot VIA 6445 leading train VIA 635 past CN Couteau in Quebec on its way to Ottawa ON, around noon. 2011/05/02 - VIA 6445 was spotted on train VIA 32 from Ottawa to Montreal, then again on VIA 59 from Montreal to Ottawa and Toronto. 2011/05/03 - VIA 6445 was on train VIA 71 and VIA 6408 was on train 70. Aivo Merimets shot them both in Brantford, Ontario. Gord Henwood shot it in HDR. Isn't it crazy how much information is available on the Internet? Operation Lifesaver has prepared a railfan safety guide. Have a look and see what you think. I think it is mostly common sense and makes some good points... especially about setting a good example. Any comments on it? Things that should be changed? Added? Deleted? Daryl Adair, Director of Operations at the Winnipeg Railway Museum, put out a call for volunteers for tonight (May 4) for their annual spring cleanup night. (1) Sweeping the platforms of the winter dust. (3) Cleaning windows on the CN Caboose, Mack Rail Bus, Packard and display panels. The event starts at 7 PM at the Museum, in the VIA Rail Union Station in downtown Winnipeg. Refreshments will be served at the end of the night. Here's a little video I took on September 2, 2006. I first wrote about it here. The story is told in the video. As I said in my post, I couldn't call out to them because I was a long way away and there was too much noise anyway. I'm glad they didn't get hurt and I hope they learned a lesson. ATVs are a big problem in McAdam. Later in 2006 I mentioned that the westbound NBSR freight grazed an ATV, also in McAdam. They were constantly buzzing around the yard. Enjoy your ATV... but responsibly, please. Watch out. May 2-8 is Rail Safety Week across Canada! Operation Lifesaver will be hosting events across Canada to promote rail safety and educate the public about how to be safe around trains. I will have several safety-related posts this week. This video was shot near Stackpool, Ontario on April 14 and shows a sizeable washout, as it happens. I believe the footage was shot by a CN employee with their phone.